Times are tough for a lot of people. The U.S. and worldwide unemployment rate is very high and many of us are looking for ways to start home based businesses on the internet. I’m one of those people too. That’s why I started my own internet businesses. Real Internet and Affiliate businesses are not “Get Rich Quick Schemes”, but I’ve seen a lot of advertisements on the web that say you will earn $10,000 in the first month. The truth is that there is a lot to learn and it can take months or years if you search out everything by yourself. The ebooks and web templates offered below are designed to provide lots of instructions and experienced expert advice for a quick start on how to start your own business or do better marketing for an existing one. The IProfit packages offer far more ebooks, software, and appropriate content than any other Ebook or template packages I’ve seen. They also provide excellent instructions, articles, and tutorials for starting your online business with the content provided being your own products with master reseller rights. These products can also be given away as incentives, added to other packages, and basically used in any marketing or sales plans you want since you get full master rights for a very low price. When I first bought this package myself I was amazed with not only the variety of ebooks, but the software tools also offered, and sales websites as part of each ebook package. The resources and instructions for setting up your own websites to sell these products are also very detailed. Even though I am an experienced webmaster there were some really good tools I wasn’t aware of in the package. Please take a look at the details of these packages by clicking on the links above to see the ebooks and templates available, and you will be really impressed. Ebooks and Web templates have become very popular in the last few years both as products to sell and as Bonus giveaways to attract users to a website. What I’m offering is one of the best combinations of pre-packaged business ebooks and web site templates to help you build a business quickly. 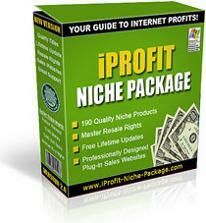 What are in the IProfits Ebook, Niche, & Template Packages? 1. This is a package of 180 full products, with web pages, and resell rights so you make all the profits. 2. It comes with an attractive salespage you can simply upload, with your own PayPal button, and so receive all the sales to your own account. This is not an affiliate program! 3. It has a salespage creator, so you don’t even have to mess with editing the files if you’re not comfortable doing so. 4. It has lifetime updates. And not like other packages, where the support and downloads disappear after a few months. I’ve been selling this for years - and it’s constantly updated with new additions. 5. You don’t have to host the downloads page yourself. Your download page sends visitors to the iProfit Website where they can download their purchases, and a side benefit is the download page will always contain the latest package. No need to mess with updating! This is a very useful package that makes an ideal addition to any website. Offer the iProfit Package to your own visitors or subscribers - and rake in the profit! 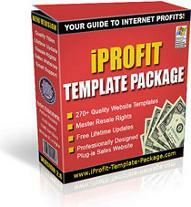 The IProfits Template Package offers similar value for building your own quality websites quickly. You can even start your own website design business with IProfits templates. See further details about all of the IProfits packages we offer are below. * Sell iProfit eBook Package by itself (as it is being sold on this site) using the professionally designed sales website provided. * Sell the individual products contained in iProfit eBook Package, using the professionally designed sales websites provided for each product. 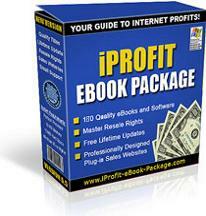 * Create your own packages by combining the products contained in iProfit eBook Package. * Learn how to create your own bestselling information products from scratch, by using the information and resources found in iProfit eBook Package. * Promote your existing products & websites using the information and resources found in iProfit eBook Package and watch your profits skyrocket! * Learn how to make thousands of dollars every month promoting other people's products, using affiliate programs. * Plus anything else you can think of - the possibilities are endless! We will also give you 14 additional ebooks with the main bonus package which offer lots of additional information and advice on Internet Marketing and Business for FREE.